Pakistan Super League season 4 was in full swing and the fans of cricket were supporting to their teams during this mega event. Different posts are being shared on the social media about PSL 4. However, the ex cricketer and commentator, Rameez Raja overwhelmed on the social media. Rameez Raja Gets Popular on Social Media During PSL 4. Rameez Raja has the beautiful chemistry with the PSL presenter and ex Miss Australia, Aeron Holland and it is getting popular on the social media. The users are giving beautiful comments on their closeness. 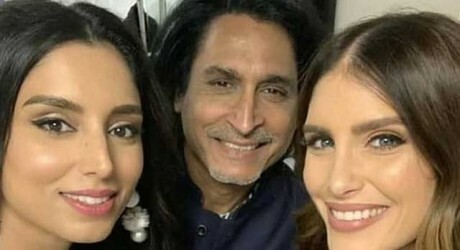 One user has shared the pictures of Rameez Raja during PSL 4 and PSL 3, in which he is looking with Neelum Munir and Aeron Holland. A funny comment was given on this picture and it is written, ‘Rameez Raja is winning the PSL yet’. Another picture of Rameez Raja is also being shared on the social media, in which he is looking with Aeron Holland and Zainab Abbas and various funny comments are being given over it. A user gave the comment and wrote, ‘Prince Biscuit with chocolate’. Another user annotated it as ‘Shami Kabab Burger’. Few pictures of Rameez Raja were shared from a social media account and the caption was given, ‘When all people were busy in India Pak War, Rameez Raja was busy in playing his game. A video of Rameez Raja with Aeron Holland was shared on the social media and the users have criticized over it.